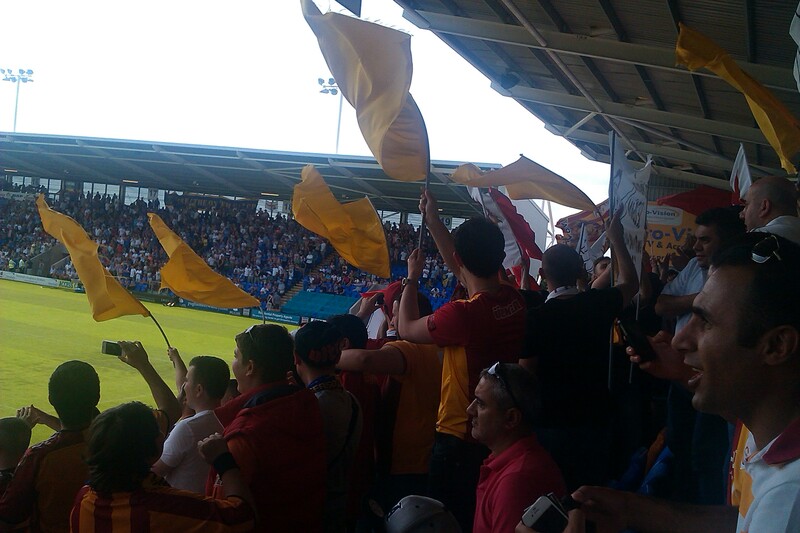 In the second strangest fixture of the 2013/14 pre-season (Bournemouth vs. Real Madrid narrowly taking that title), Turkish champions Galatasaray visited League One Shrewsbury. Galatasaray are famous for their slogan of ‘Welcome to Hell’, with a reputation as being some of the most ferocious fans anywhere in the world. The fanatical support and devotion to the club will always be overshadowed by the events of Istanbul in 2000, when two Leeds fans were murdered before a Uefa Cup clash with Galatasaray. I have spent the last year investigating different football cultures and having never been part of a Turkish football crowd decided to attend the game. This was not an acceptance of what happened to Chris and Kevin thirteen years ago, and I understand if any readers of the site who support Leeds United choose not to read anything I produce in future. 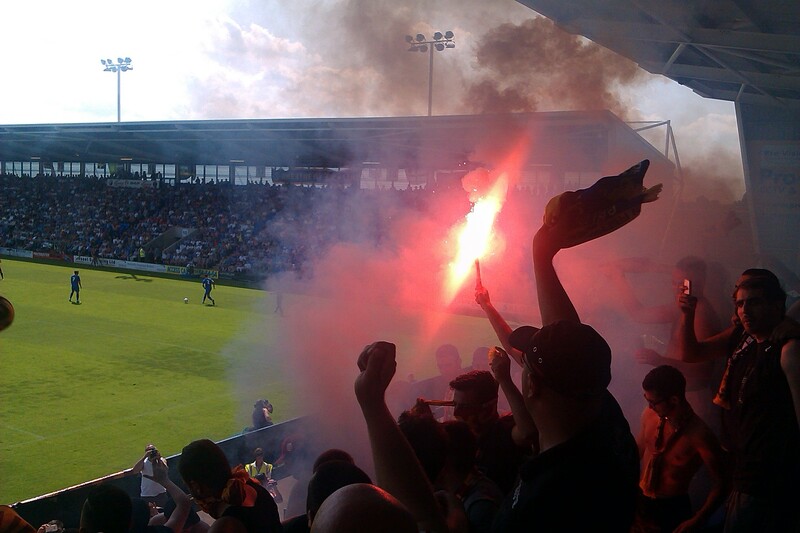 With that said, here is what happened when the sleepy town of Shrewsbury was visited by the Ultras Aslan. 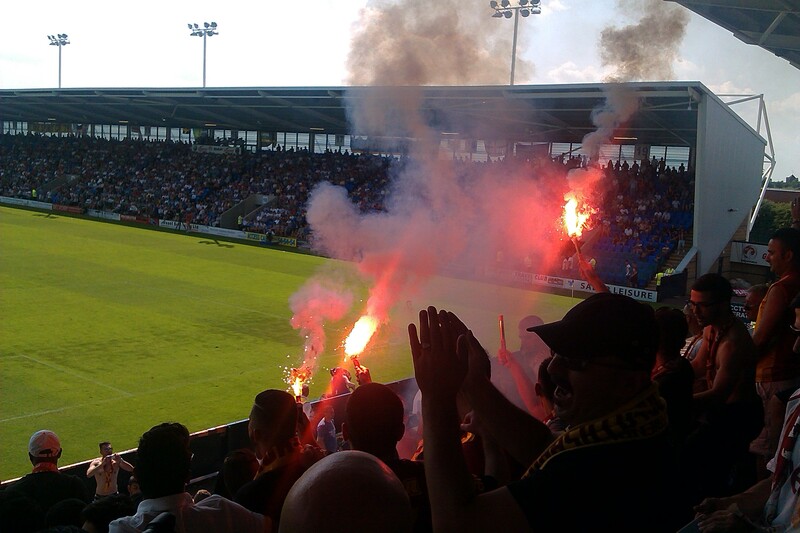 The first sign that this was no ordinary pre-season friendly was the presence of a number of riot vans at Shrewsbury train station several hours before kick off. An unusual sight for a regular game in the lower leagues, never mind a friendly. 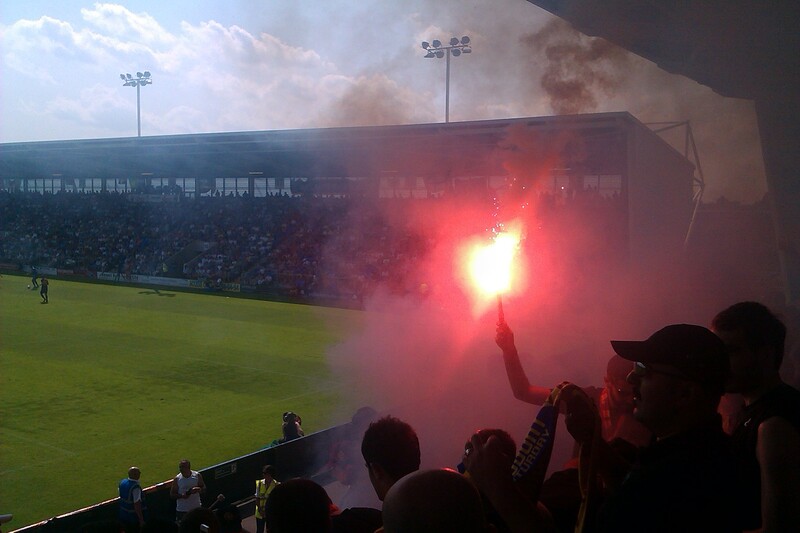 Around 6000 fans turned up to see Shrewsbury try their luck against arguably the most infamous side in Europe, with around 500 away fans at my best estimate. The majority of the travelling support appeared to be English based Galatasaray fans, perhaps unsurprising when the Turkish champions have a visit to the Emirates Stadium to look forward to next month. Wherever they had come from, the away fans were in the mood to make a noise. I got into the stadium to find that a large crowd of people wearing shirts with ‘Welcome to Hell’ and ‘Ultras Aslan’ were in my seat. I decided it was probably best if I didn’t politely ask them to move. As with the majority of German supporters I have witnessed, the Galatasaray fans had a designated ‘leader’ who would get the chants going. However, it was all a little more chaotic than what I have seen at the likes of Dortmund and St Pauli, with leadership regularly changing as as many fans as possible tried to conduct the crowd. Perhaps the most impressive chant was something I had seen on YouTube previously, as the crowd was whipped up into a crescendo, before the fans leader urging them to “ssshhhhhh”. After a period of silence the noise erupts, as the fans jump around as though they were in a mosh pit at a Slayer concert. I’ve seen football fans bounce up and down, from side to side and with their backs to the pitch, but Galatasaray were somehow doing all of this at once. The game was never likely to be much of a contest, and it took just four minutes for the red and yellows to strike first. The Shrews had barely touched the ball as Galatasaray knocked it around with ease, before Emre Colak curled the ball into the corner of the net from some way out. The fans mood barely changed with the goal, they were too busy being mental. It felt as though quite a lot of the home crowd were tourists on a day out to see Drogba and Sneijder, but the fans to the right of the away supporters did their best to create a good noise, along with a ‘Breathe on ’em, Salop!’ banner. It remains to be seen how tactically effective breathing on your opposition may be, but I can’t recommend it on this evidence. Galatasaray quickly realised that their opposition couldn’t really match them, and as a result the intensity and urgency of the game calmed a little. Shrewsbury weren’t being embarrassed, it was just abundantly clear that there was a significant gap in quality between the two. The away fans continued to sing throughout the first half, and it was noticeable that a number of Chelsea fans were in the away end from the increased noise every time there was a chant about Didier Drogba. One such Chelsea supporter had a tattoo of the former Blues hero on his back, and would run onto the field towards the end of the game to hug his idol. The Ivory Coast striker clearly has fond memories of his time at Stamford Bridge, as he escorted the fan off the pitch and ensured that the police did not arrest him. Stewards rushed into the away end with buckets of water, but perhaps wisely decided it was best not to kick anybody out. The atmosphere comes across better on this video, although I suggest turning down your volume and not watching the video if within range of any sleeping family members or loved ones. The noise levels continued throughout the second half, with one particularly co-ordinated chant involving the entire away end. Each section of the stand would shout a certain part of the chant, pointing at the block next to them for them to carry it on. So engrossed were the fans in this chant that 99% of them missed the third goal, Wesley Sneijder adding a third goal to the tally moments before the end. With the party coming to a close and many of the Galatasaray fans perhaps unlikely to be able to watch their side live again for some time, they notched up the party for the last view minutes. Scarves were bowed in the direction of the pitch, shoes were waved in the air and songs were sung in English in the direction of the home crowds. “Your support is (very bad)” and “Let’s go (extremely) mental” the family friendly versions of these final taunts. There was also time for the “Worst idea of the 2013/14 season” to be won in the very first game, as a fan revealed a Fenerbahce shirt in the away end. As you can imagine, this displeased rather a few people, although he did avoid being set on fire and waved in the air to replace the flares that had already been used up. Due to the Leeds United incident and a history of violence I did not come away from the game with the same feelings as after watching Dortmund, St Pauli, Inter, Venlo and the various other clubs around Europe , but on this occasion at least the Galatasaray supporters behaved and created a phenomenal atmosphere. I still plan on attending an Istanbul derby this season…if things are this wild in a small town in Shropshire, I can only imagine the hell which awaits when things really get serious. Posted on July 14, 2013, in General. Bookmark the permalink. 2 Comments. Interesting endeavour. Hard to say no to such a bizarre fixture, and the lack of a competitive context is probably as safe as you can get to GS putting together an “away” following. I don’t fully resonate to the Galatasary hatred a Leeds fan is expected to, probably mainly because I wasn’t immersed in the whole culture when it happened. 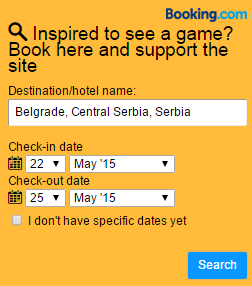 That being said, Turkish teams I have the least time in the world for. I try to stay away from sweeping statements, but it looks as though football fans just don’t do moderation in Turkey. Romanian media had a magnifying glass on the Turkish league throughout the 90s and 00s, when we had a fair bunch of internationals playing for Galata, Fener, Besiktas & others, and it’s just mind-boggling to see the frequency of extreme manifestations you get there. They torch their own ground out of sorrow, corner players at training, burn their cars, threaten them with worst for poor results. And the media is equally non-reserved, every Monday headline is inflammatory (I remember Hagi getting stick after a couple of bad results when he was managing GS, and then getting a win that prompted a “let them cut off our hands that wrote poorly about him” front page the next day). I can understand the “football/the club is my life” mentality to an extent, but the truth is most people put it through a fair degree of common sense in applying it. Doesn’t look like many Turkish fans do. Decent read. 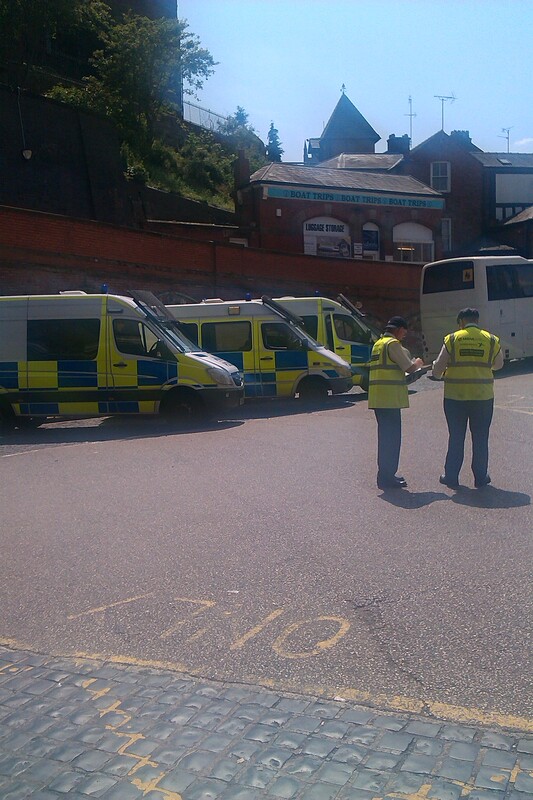 Just one point to correct you on, riot vans are an extremely common sight in the lower league and you will see them parked at Shrewsbury station on the majority of match days!